This next Monday is Labor Day. Labor Day has been an official federal holiday since 1894, but it has become much more than a day to honor American workers. It is also accepted by many to be the end of summer (although summer is not officially over until the autumnal equinox occurs, which happens on September 22 this year.) Fashionistas will tell you it is the last day to wear white shoes until next spring. 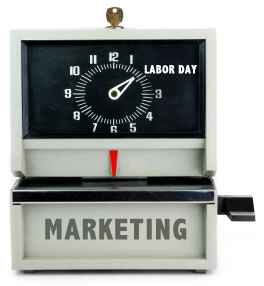 However, Labor Day in business means a couple of things. First, it ushers in the September budgeting for next year for those companies whose business year is the same as the calendar year. Secondly, it is crunch time for marketing to work and turn leads into sales. Let’s look at these two items. If you are in charge of marketing for your company, budgeting is crucial to your success. It is often easy to take the current marketing budget, add 5% to it and try to slip it past the bean counters. Saying that you are going to do everything you did this year plus a little bit more is the lazy way out of budgeting. That may have worked years ago, but now marketing budgets are being scrutinized for ROI more than I can remember in my 20 years in business. You have to prove that what you are doing is bringing in tangible results (revenue) into your business or face a budget cut. That may be difficult with some of your critical marketing spends, such as social media. Can you link a "like” to a sale? Most companies cannot. However, where all marketing should lead to sales, some take a less than direct route to the cash register. We like to break marketing down into three areas that feed one another. They are Awareness Marketing, First Time Sales Marketing and Retention Marketing. If you budget for all three, you should be able to easily track a potential customer through the process of making them aware of your brand, enticing them to buy from you for the first time, and then retaining their business after the sale. If all of your marketing dollars are being spent on awareness, you are out of balance in your budget. You need to rethink your process. The budget doesn’t need to be equal in all three of those areas, but there needs to be significant marketing activities in all three or your marketing strategies need to be reworked. That leads to the second marketing item that gets a lot of attention in September: converting leads to sales. Whether your fiscal year starts in October or January, right now is when there is a lot of pressure to close the deal. That means that your marketing efforts from this year are probably being scrutinized for their effectiveness. Good! You should be able to link what you are doing in marketing with the progression of prospects through your sales cycle. There are all kinds of tracking software that will allow you to do this. Whatever you do, you never want to let a new customer go through your sales process without finding out how they heard of you, what caused them to buy from you in the first place, and what is needed to get them to buy from you again. Marketing today is all about meeting the needs of the customer – pure and simple. Make sure you are measuring all of this. Labor Day is upon us. Are you ready for marketing crunch time? The key is budgeting wisely and keeping track of your marketing to sales statistics.